Mimi has whipped up a delicious Mexican feast, piled high on homemade tostadas. Tostadas are simply toasted tortillas, making them crispy and crunchy! 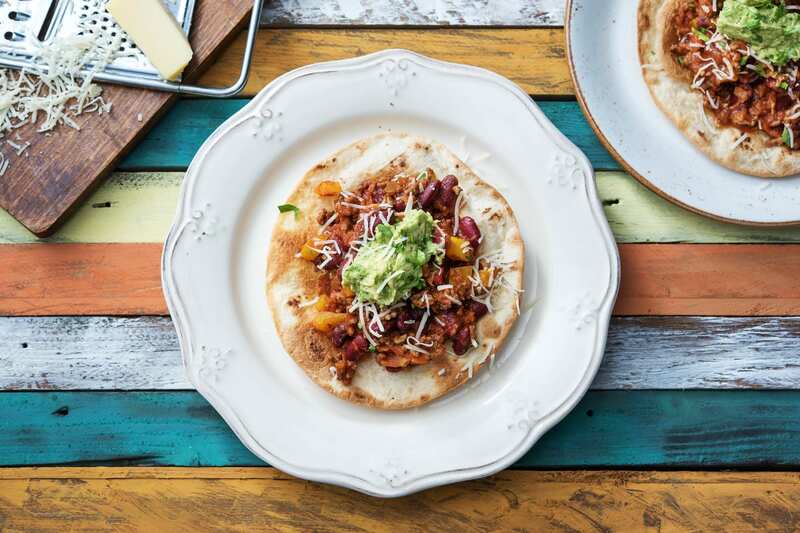 We have given you plenty of tortillas in this recipe; have a look at the HelloFresh blog for ideas on what you can do with the leftovers! Preheat your oven to 220 degrees. 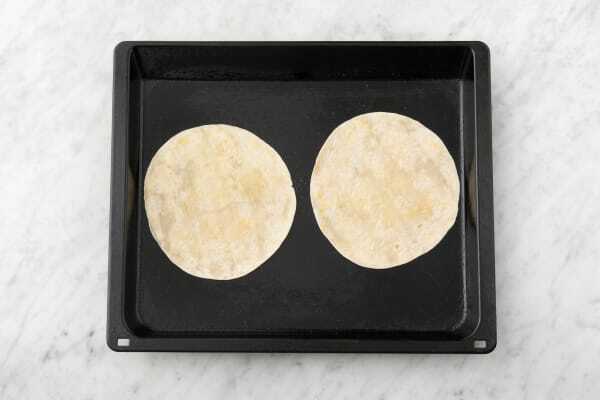 Pop the tortillas in a single layer on a large lightly oiled baking tray and drizzle over some oil. Sprinkle over some salt and black pepper (it's easier to just get this job out of the way so you can pop them in the oven later). Cut the onion in half through the root. Peel and chop into ½cm pieces. Peel and grate the garlic (or use a garlic press if you have one). 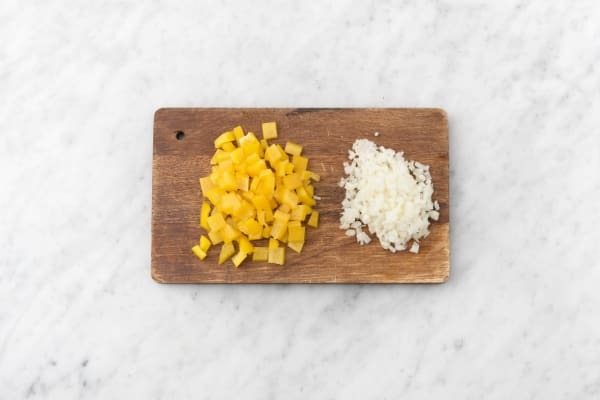 Remove the core from the yellow pepper, then chop into 1cm chunks. 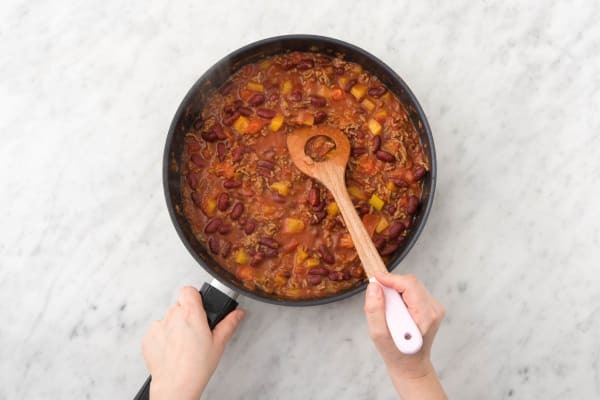 Drain the kidney beans in a colander and rinse under cold running water. Put a large frying pan on medium-high heat with a drizzle of oil. Once the oil is hot, add the beef mince and cook for 5-6 mins until browned. Tip:Heating the oil before adding the meat means the beef will fry and not stew. Once your beef has browned, add your onion and pepper to the pan and cook for 5 more mins until soft. Then add your garlic and Mexican spice. Stir together and cook for 1 minute more before pouring in the plum tomatoes. Break them up with a wooden spoon, then add 1 tbsp of water per person. Add the beef stock pot and stir well until it dissolves. Add your kidney beans. Bring your beef mixture to the boil, then lower the heat and simmer gently for 10-15 mins until it is thick and tomatoey and has reduced by half. Taste and add some salt and black pepper if necessary. Meanwhile, pop your tortillas on the top shelf of your oven for 3-5 mins. Keep an eye on them, you want them to be golden and crispy but not burnt! Once cooked, remove them from your oven and lay on some kitchen paper to absorb any excess oil. Grate the cheddar cheese. Slice lengthways into the avocado, once you reach the stone turn the avocado around to cut it in half. Twist each half and pull it apart, remove the stone, then scoop out all the insides into a bowl. 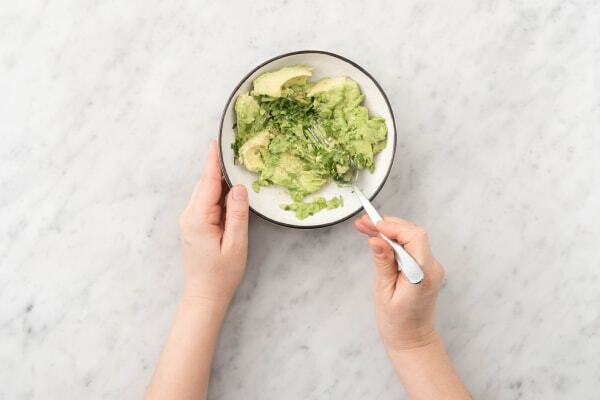 Roughly chop the coriander (both stalks and leaves) and add your stalks and half your leaves to your avocado. Squeeze in a good splash of lime juice and mash together with a fork. You've just made guacamole! Tip:It should still be a little lumpy for that rustic look. Assemble your tostadas by laying one tortilla on each plate, piling high with your beef, sprinkling with cheese and a dollop of guacamole. Finish with a sprinkle of your remaining coriander leaves and tuck in!